Southern Music Museums: Why No Good Concert Posters? I recently conducted my own musical-history tour through Memphis and Nashville, TN, and Tupelo and Clarksdale, MS. I visited eight different music museums / institutions and saw some amazing stuff… B.B. King’s guitar, Hank Williams’ boots, Sam Phillips’ original studio console, Otis Redding’s suede jacket, and even the structural birthplaces of Muddy Waters and Elvis Presley. But you know what I didn’t see? ONE good concert poster. Can you believe that? We’re talking about GRACELAND, for heaven’s sake; plus Sun Studio, The Stax Museum, and the Smithsonian’s Rock ’N Soul Museum in Memphis; Hatch Show Print (!) and the wonderful Country Music Hall of Fame in Nashville; Elvis’ Birthplace Museum in Tupelo; and the Delta Blues Museum in Clarksdale. Most of these places focused on personally owned items such as guitars and clothing, plus a huge array of support material. That’s fine and good, and I enjoyed it all immensely. But concert-poster wise, it was left wanting. For example: Here I was, beholding the actual log cabin in which Muddy Waters lived as a child, on display inside the Delta Blues Museum. 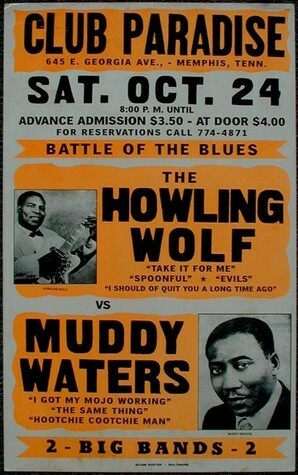 And on the wall of the cabin is… a lousy 1970 common reproduction Muddy Waters / Howlin’ Wolf concert poster? Yes, good blues concert posters that are 40 or 50 years old (http://www.postercentral.com/blues.htm) are hard to find, but not impossible. Same with Hatch Show Print and the Country Music Hall of Fame… where were the vintage Hank Williams, Carter Sisters, Willie Nelson or Johnny Cash concert posters (http://www.postercentral.com/country.htm), or even that countrified “hillbilly cat” from 1955, Elvis Presley (http://www.postercentral.com/elvispresley.htm)? Now perhaps to the layman, there were a few decent concert posters sprinkled here & there throughout the eight institutions. But I’ve probably loaned 100 posters & artifacts to museums over the last two decades… from Los Angeles to Cleveland to New York to Paris. As I write this, I have posters on display in L.A.’s Grammy Museum and Ray Charles Memorial Library. So I know a decent poster in a museum when I see one. I’ve pictured (to the left) the common Muddy Waters poster the Delta Blues Museum has on display, and then (down below) two authentic, rare, original Muddy concert posters which truly belong in a museum. Sure, they’d be much pricier, but isn’t that what we expect from museums? A source at the Rock ’N Roll Hall of Fame and Museum in Cleveland, which always has some outstanding concert posters on display, told me that it just means the curators of the Southern museums didn’t prioritize concert posters when they assembled their exhibits. It’s as simple as that. And I think that’s a shame. A great 1954 R&B concert poster that’s so packed with talent, Muddy is down at the bottom… although it’s definitely a case of the concert promoters saying “last but not least.” Sorry about the torn-away corner, but you take what you can get with Muddy from the 1950s. Just take a look at that blues and R&B talent he shares the poster with… not a clunker in the bunch! A beautiful 1968 Muddy Waters concert poster from Denver, Colorado. This large cardboard gem presents a mystery right off the bat: What’s with that word “Paw”? I consulted some heavy Muddy authorities, including his biographer, and they haven’t a clue. Is it an obscure or erroneous song title, or possibly a nickname somebody gave him for five minutes? And then there are the glaring typos on the poster, which would send legendary keyboardist Otis Spann and Muddy’s More Real Folk Blues album running for cover. And no, vocalist Clear Waters was not related to Muddy. This entry was posted in **All Posters, Blues, Boxing-Style Concert Posters and tagged 1950s, 1960s, blues poster, concert posters, Muddy Waters poster, music museums, R&B posters, rock posters. Bookmark the permalink.